Gout is a complex form of arthritis in which uric acid accumulates in the joints and causes severe pain with redness around the affected area. The disorder is more common in men, but it also affects women after menopause. The pain usually hits you in the middle of the night and is unbearable. It feels as if your big toe is on fire. The affected joint often becomes so tender that even the weight of the sheet feels too much to handle. The good thing is that you can treat gout using different gout home remedies and keep it from coming back again. In most cases, you can treat your condition with home remedies for gout. It is advisable to see your doctor if the pain persists or your condition gets worse with time. Why it helps: Baking soda mixed in water can help reduce high uric acid. It may take a couple of days to experience relief, but it usually works quite well and helps avoid future attacks. How to apply: Simply mix ½ teaspoon baking soda in about 8 oz. of water and drink it at least once a day. You can take 4 teaspoons throughout the day to deal with an acute attack. Avoid using this remedy if you have high blood pressure. Why it helps: Apple cider vinegar stimulates digestive juices, including bicarbonate and creates an alkaline-forming state in your body by neutralizing stomach acids that relieves headaches, joint pain, muscle spasms, gout, and arthritis. How to apply: Mix a couple of tablespoons of vinegar with 8 oz. of water and drink it at one time instead of sipping on it. Be sure to use organic vinegar. Why it helps: Epsom salt works because it contains magnesium that helps treat arthritis and gout. How to apply: Before taking a bath, simply add a couple of cup of Epsom salt to your bath water. Soak your body in it for some time. Repeat the process at least once a week to relax aching muscles and pain. Cherries contain antioxidants and anthocyanins that help reduce the inflammation and limit the gout flare-ups. Cherries juice, cherry compote, cherry jam, and other forms of cherries may reduce toxins from your body and eliminate uric acid. You can start with a ½ cup serving of cherries a day to avoid subsequent gout attack. Lemon Juice helps neutralize the excess uric acid by alkalizing the body. You may squeeze a fresh lemon in a cup and add ½ teaspoon of baking soda to this solution. Stir it nicely and drink it immediately. Alternatively, you may simply drink fresh juice of half of the lemon thrice a day for good effects. Eating an apple is good for many things, but it can be among the best gout remedies mainly because it contains "malic acid" that neutralizes the excessive uric acid in the body. Eat an apple after a meal for faster effects. The availability of phosphorus and potassium in large amounts makes bananas a great fruit for people with gout. These substances can turn uric acid crystals into liquid, which can then be removed out of your body with ease. Bananas contain vitamin C as well that works amazingly well to alleviate pain and swelling. Grapes are alkaline and neutralize uric acid to reduce gout flares. If you have diabetes, you should consult with your healthcare provider before adding grapes to your diet. The same goes for bananas. Strawberries, Amla or Indian gooseberry, and oranges are all rich in vitamin C and help neutralize uric acid. Cucumber is another food you may want to add to your diet if you're dealing with gout. Due to its high water content, it helps flush toxins and uric acid out of your body. Prepare a juice mixing up cucumber, carrot, and beetroot for better taste. 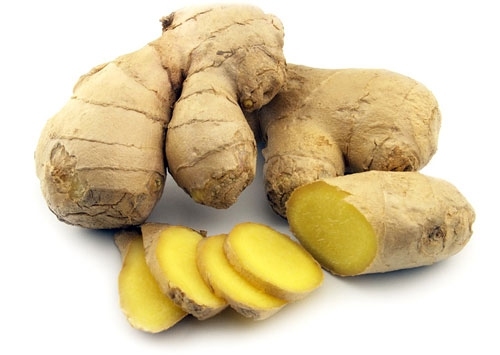 Why it helps: Ginger root has anti-inflammatory properties and is quite effective in treating gout. How to apply: You can use a small amount of ginger in food or prepare a mixture by adding ginger pieces to boiling water. Drink this mixture at least once a day. Make ginger paste using water and ginger root, and apply it directly to the affected joints to reduce swelling. Nothing can beat water when it comes to putting up a fight against gout. Staying hydrated is one effective way of limiting gout flares. It will also help your body transport waste and nutrients, regulate temperature, cushion tissues and joints, and prevent kidney stones and constipation. Drinking plenty of water will also help eliminate excess uric acid from your body, which will prevent gout attacks. Be sure to drink at least 64 ounces of water a day, and more if you exercise. You can try home remedies for gout and take medications to improve your condition, but you can keep future attacks from happening by making some lifestyle changes. For starters, you should say no to drinks sweetened with fructose and all types of alcoholic beverages. Replace these beverages with water. Don't eat food that's high in purines – this may include organ meats, red meat, and seafood. Above all, you should exercise regularly and keep your weight in check to reduce the risk of gout. Why it helps: Taking a charcoal bath may sound weird, but the research has confirmed that activated charcoal can absorb uric acid and relieve gout pain. It can be especially beneficial for ankle and toe-based gout. A charcoal paste is usually a better choice for elbow- or knee-based gout. How to apply: You can make a charcoal paste by mixing a half-cup of charcoal powder in water and then stirring it thoroughly. It is now possible to find charcoal supplements that you can take to enjoy similar benefits.